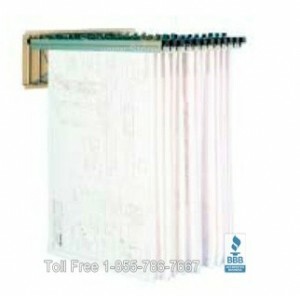 Are you are looking for an easy way to store and organize large documents like blueprints, drawings, maps, posters, or banners? 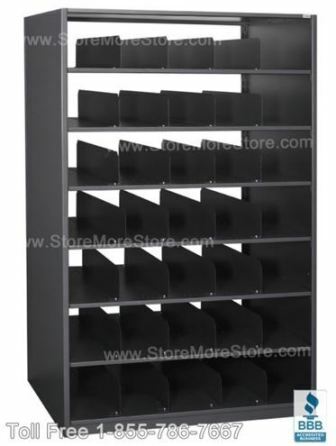 StoreMoreStore has Adjustable Cubby Shelving that is designed to help you efficiently arrange your documents while maximizing your storage space. 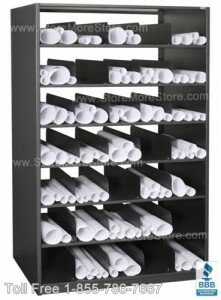 (Shop online now for your Adjustable Cubby Shelving). 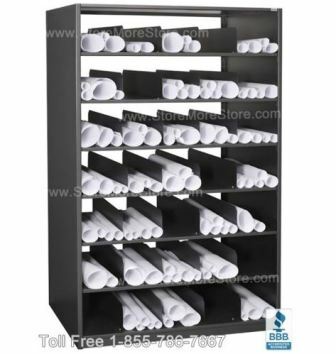 Our Adjustable Cubby Shelving has multiple adjustable partitioned storage openings, which provide you with flexibility when arranging your blueprints and documents. In addition, large documents and blueprints can be categorized and stored rolled up in the shelving, so they won’t get damaged or smashed. Our Adjustable Cubby Shelving will maximize the number of blueprints and documents you can store in a designated area because they are stored on vertical shelving. 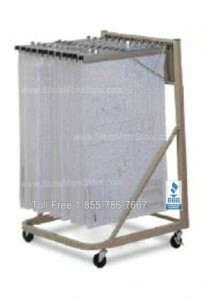 Also, our storage shelving is easily adjustable, and it can be configured to store a variety of items (documents stored flat and other related storage materials) all in the same unit. 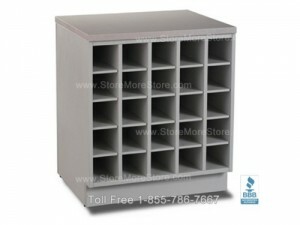 Our Adjustable Cubby Shelving comes in numerous sizes and colors to meet your storage requirements. If you can’t find the exactly what you need, call us toll free at 1-855-786-7667 we will help you create a storage system exactly the way you want.